This page is about the American medium tank M4A3 (105). For similar vehicles, see M4A3 (76) W and M4A3 (76) W (Japan). The Medium Tank M4A3 (105) HVSS Sherman is a Rank II American medium tank with a battle rating of 3.0 (AB/SB) and 2.7 (RB). 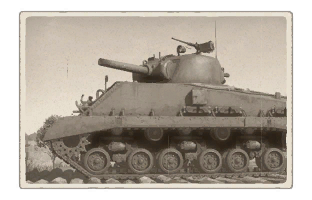 It was one of the first American tanks to be released with the American ground tree in Update 1.45 "Steel Generals". Armed with a 105 mm howitzer instead of the standard 75 mm cannon, the howitzer grants the Sherman a much more powerful high-explosive shell to use against lightly-armoured enemies. When the HEAT round is unlocked for the cannon, its firepower against more heavily armoured vehicle increases substantially. The M4A3 (105) has certain flaws that can be exploited quite well. First of all, the howitzer armament means that the shell travels in a low-velocity, meaning the M4A3 (105) will be unlikely to engage at a long distance. Another is the fact that the M4A3 (105)'s gun has a long reload and a slow traverse speed, meaning it is also not very good in a close-range encounter. Despite these flaws, the M4A3 (105) is a formidable foe with its armament. The HE and HEAT shell the 105 mm can dish out has a real possibility to knock out friendly crew and teammates, if not absolutely destroying light tanks. These high-explosives can also break tracks easily, causing the player tank to be immobilized and exposed not only to the M4A3 (105), but to the other enemies as well, and the M4A3 (105) will most likely not be alone. To engage the M4A3 (105), try not to engage its frontal armour if in a tank with BR lower than 3.7. It's frontal armour, despite what most will say about the Sherman's armour, is quite formidable and can deflect most incoming enemy round from light and medium tanks. This is why it is recommended to bring high-velocity guns like the 3-inch on the M10 or the long 75 mm on the later Panzer IV. If it can't be engaged from the front, maneuver to its side and rear armour, as these armour plates are extremely vulnerable to even 37 mm guns. 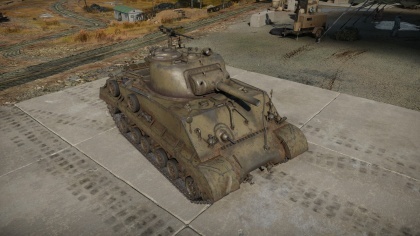 When maneuvering around the M4A3 (105), try not to expose the tank for a prolonged time and move faster than the M4A3 (105)'s slow turret traverse rate (though beware that the M4A3 can compensate this slow turn by turning the entire body). If fast enough, a tank could also move past the 105 mm low-velocity shell and mess up the enemy's lead. This will eventually lead to a good shot on the M4A3's weak points. Another more simpler and less mobile way is to lie in wait in a tank destroyer such as the StuG III for the M4A3 to move right into the TD's line of fire, giving a clean shot to a vulnerable armour part. A good shot on a general part of the hull can ignite one of the many ammo racks strewn around the interior. 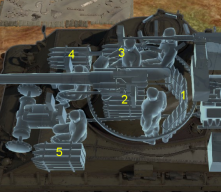 Ammo racks layout of the M4A3 (105). Having in mind the large caliber of this tank's main weapon, one can conclude that the HE shell (M1 shell) is big enough to dispatch some tanks. However, any armour larger than 28 mm won't let the explosion result in a penetration. So for firing at strong armour plates, the HEAT shell (M67 shot) is required. It should be top priority to research it. The HE shell will however be the most effective option whenever this Sherman's controller can find a suitably soft spot in the enemy vehicle's armour. Against soft vehicles, like most SPAA, the choice of ammunition for the main gun is fairly irrelevant, since a single shot should be enough to dispatch one of these, and remaining crew members can be taken down with one of the tank's Browning machine guns, although HE is certainly the most effective at dishing out damage when armour is absent. The HEAT round, unlike the HE one, has a tracer charge, which facilitates aiming. This is not critical, however, since the HE shell's sheer size allows for it to be seen without too much effort. The M4A3 (105) HVSS Sherman is a support tank, not a front-line brawler. Its adequate armour protection and powerful gun put it on about the level of the M10 Tank Destroyer, but it has certain flaws and qualities that makes it different than the usual Sherman tanks. Due to the 105 mm howitzer, knocking out enemy crew in lightly armoured vehicles is a piece of cake. Aim for the enemy tank's lower turret to cause the most damage possible with the HE shells, as the HE shrapnel can be deflected down onto the hull roof and mess up the enemy crew. The 105 mm HE could also be aimed at the enemy tracks to blow it off, immobilizing the enemy. If none of the HE shells do damage to the target (which shouldn't happen most of the time), a well placed HEAT shell, once unlocked, can easily set a tank aflame or blow up ammo stores. Don't get to close to enemy vehicles unless it is a limited traverse gun tank destroyer, in which case blow up its tracks with an HE that should do the trick. A downfall(s) of the M4A3 (105) HVSS Sherman is its average mobility, slow turret traverse, and slow reload. Therefore, it is recommended to stick to allied tanks like glue, or rely on hit-and-run tactics. The low velocity makes long-range shots relatively difficult. Never stay in the sights of tanks such as the long-barrel 75 mm Panzer IV F2/G, StuG III F/G or T-34/KV-1. These tanks can penetrate the M4A3 (105) HVSS Sherman's front armour, some more easily than others. Try not to get hit in the rear area as it will set the tank on fire and immobilize it, putting it in an extremely disadvantageous situation. Parts, M67 shot and Fire system are key! Followed by all accuracy improvements, everything else is optional, but Artillery and all mobility upgrades are welcomed. Devastating against lightly armoured tanks. HE shells can cause serious damages even with a non-penetrating hit. HEAT shell option with approximately 100mm of penetration even at long range, making it able to take on even KV-1 tanks frontal armour. Additionally, HEAT shells have a high chance of causing hull breaks on lightly armoured foes. .50 cal machine gun on top can provide AA defense. HVSS suspension gives good cross-country mobility. Wide tracks makes it easier to brake at high speeds and climb steep mountains. Better sloped frontal armour that can withstand lots of punishment. Inaccurate at long ranges due to large shell size and low muzzle velocity. Shell drops very fast, poor for long-distance fighting. Stock HE ineffective against even moderately armoured tanks. Often targeted due to the large 105 mm gun. Side and rear armour are very weak in comparison to the front. Very slow turret traverse rate, relies on turning hull to get gun onto targets away from turret front. Poor stationary turning ability combined with slow turret traverse makes flanking enemies a dangerous foe. The M4 Sherman were originally equipped with the 75mm M3 cannon. Though the 75mm was thought to be an overall effective gun, certain situations called for more destructive power. Enter the 105mm M4 Howitzer, a mountable artillery piece for a tank. The army decided to arm the Shermans with these artillery pieces for a radical increase in explosive power. The first of its model was a M4A2 Sherman with its turret mounting the formidable cannon in the M52 mount, these Shermans were designated M4(105) and were accepted into service in February 1944. Later, M4A3 Shermans were also being converted into 105mm with the name M4A3(105) When the HVSS was developed for the M4 Shermans by mean of the M4A3E8, the same was applied to the M4s with the 105mm because of its increased weight, so an improved suspension would increase mobility. These Shermans were then designated to M4(105) HVSS or M4A3(105) HVSS and remained that way to the end of the war. The 105 mm Shermans were produced by Chrysler Corporation at the Detroit Tank Arsenal. 800 M4(105) and 841 M4(105) HVSS were produced from February 1944 to March 1945, and 500 M4A3(105) and 2539 M4A3(105) HVSS were produced in May 1944 to June 1945. This brings a total of 4680 Shermans with the 105mm howitzer as its main armament during its production time. After World War II ended, the M4A3E8 with the 76mm cannon and 105mm howitzer became the mainstay of the United States armoured forces as they were the most advanced version of the Shermans at the time. Despite its role as an bunker-buster weapon, the M4 (105) are also quite good tank killers. Documents show that the HEAT rounds fired from the 105mm has penetrated through a Panther's frontal armour, which could kill the crew. Even then, the sufficiently powerful high-explosive rounds could cause massive spalling inside tanks, harming the crew inside. This page was last edited on 26 March 2019, at 15:02.